Our February installment is presented in association with Asa Baako (one dance) Festival that takes place annually in March and a festival that we have been involved with for the last 3 years. It is one of Ghana and Africa’s most established and inclusive music festivals. Taking place over a 5 days, Asa Baako features musicians and artists from across Ghana, Africa and the world, in the spectacular paradise village-resort of Busua Beach, near Takoradi. Asa Baako has become the ultimate retreat, bringing people together from across the globe to meet, relax, share ideas, celebrate, have fun and experience a programme of Live Music stages, Sound-systems, Tours, Treks, Surfing, Beach football and Volleyball, Beach Parties and The Legendary Jungle Party. 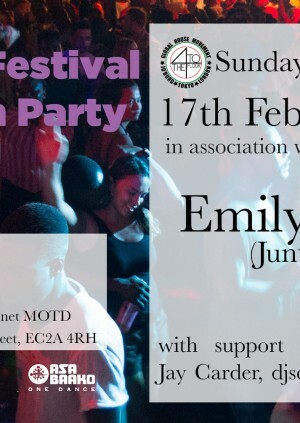 Our guest DJ for the month, Emily Dust has built an impressive reputation for showcasing the freshest sounds in the world. A Londoner born and bred and firmly rooted in her hometown’s melting pot of cultures, she seamlessly blends together forward-thinking sounds as diverse as dancehall, Brazilian neo-baile, Bristol bass, Angolan kuduro, grime and South African gqom. Her energetic sets have seen her play all over the world, in front of thousands at festival stages and in intimate basement clubs. With shows under her belt everywhere from Jamaica to Berlin, Brazil to Belgrade, Emily’s stages with the likes of Jus Now, Marginal Men, Jamz Supernova, Nightwave and more. A regular at festivals like Boomtown, Bestival and Glastonbury, her mixes have also lit up the airwaves of BBC Radio 1Xtra, Australia's Triple J, the British Council’s Selector and more. In December 2017 Emily launched Juntos, a collaborative project between UK and Brazilian artists. She curated a showcase event in São Paulo, Brazil featuring Kojey Radical (UK), Poté (UK), Sants (BR), Viní (BR), Rimas e Melodias (BR), BadSista and Linn Da Quebrada (BR). In 2018 Emily will release a Juntos EP of collaborations and present a special Juntos show for Gilles Peterson’s Worldwide FM. Support from residents Kengo, djsoulprovyder, Rickyboom and Jay Carder.